'Lightning To The Nations' (or as it is more widely and lovingly regarded to as 'The White Album') from cult Black Country NWOBHM band Diamond Head is their definitive debut record. This is the one that features their most widely known song 'Am I Evil' and if you're into Rock and Metal in general, it is an essential album to have. This new re-issue is probably the best quality sound reproduction you're going to get on CD, so while this is an ideal time to add this album to your collection if you don't already own it, for many diehard fans who do it... is still well worth laying your hands on. Of course, this nice looking digi-pack, with a booklet full of linear notes from Classic Rock scribe Dave Everley and bonus disc, make it extremely good value for money. The extra disc is compiled from singles and EP's and have not featured on any of the bands albums. Unless you own the original vinyl singles, this makes them extremely rare so it makes this second disc extremely valuable to collectors. 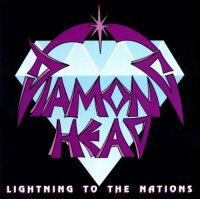 DH are more famous and widely popular than they were when they emerged onto the burgeoning and hugely popular NWOBHM scene because of the support and acknowledgement of Metallica, who state unequivocally that this group inspired them and if the band hadn't existed... neither would they. The badge of approval from Metallica exposed DH to a larger audience and has helped keep the band alive. They are still going today and have recently released a new album which is also worth getting. It's quite surprising this act never made a bigger splash at the time, with Brian Tatler's memorable Metallic riffs and Sean Harris' impressive vocals. There is no denying this album is clearly one of the strongest releases to come out of the NWOBHM scene. You can hear the Proto-Thrash element to the songs rhythms and guitar riffs which, in retrospect, are obvious influences for Metallica's sound. For me, this is an essential purchase of one of the best (cult) Metal acts ever who should have been a lot bigger than they were!